Formed in 1970 and based in Oshawa, ON, MapArt Publishing Corp. is Canada's premier map publisher and distributor. From Labrador Newfoundland to Victoria BC, MapArt has a dedicated representative across the country to service retailers in real time. Each MapArt representative is a small Canadian family business. We also distribute and service products such as the Driver's Study Guides series, Ministry of Transportation handbooks, Okee Dokee Stickers, Tree-Free greeting cards and JD☆ Sunglasses and lifestyle products just to name a few. Always on the lookout for new products to help our retail customers and their consumer customers, MapArt Publishing works with manufacturers and corporate buyers to find quality products. MapArt Publishing carries only the best in Cartographic products from a variety of publishers including CCCmaps.com, Hallwag, Michelin, Rand McNally, Tree-free and Backroads map books just to name a few. 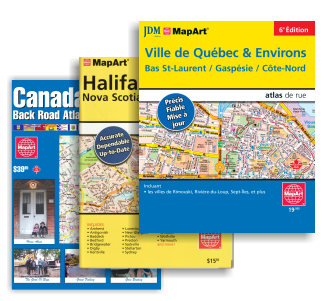 Our assortment of folding maps, tourism products, wall maps, Street Guides and Road Atlases is not only the largest available in Canada but also the most up to date. Our latest project involves a mapping every province at an enhanced scale and adding GPS compatibility, look for these new CCCmaps branded Provincial Backroad atlases where ever maps are sold across Canada.